This blog used to run a separate page on .LY listings on Sedo. As Sedo has change the link structure, and to give a better overview, we decided to close down the section and post the highlights time-to-time via the posts. Most of them very jingly and certainly short. 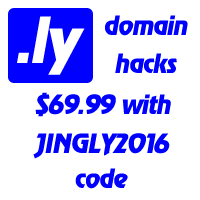 As to all .LY names listed on Sedo, we have found 306 of them. 52 of them (1/6 of the entire list) enjoyed at least one potential client. Sedo recently sold ping.ly for 3,000 USD.